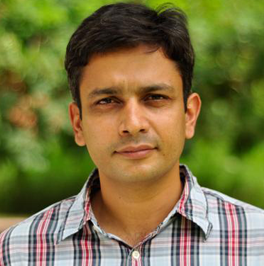 He is an Associate Professor leading the area of Marketing Analytics at MICA. He has worked as Adjunct Faculty in the field of Quantitative Marketing Research at MICA (Ahmedabad, India) for the last 7 years. He was then based out of Gurgaon, India and has taught at other Management institutes including Indian Institute of Management, Kashipur, Symbiosis, Pune and Development Management Institute, Patna. His courses include Quantitative Techniques, Business Analytics, Multivariate Data Analysis, Marketing Research, Online Research and Pricing Research. He has more than 13 years of experience. For the first 5 years of his career he worked in the IT, MR and Data Analytics industry after which he has been a regular in academics. He also consults the current Delhi government and Delhi Commission for Women on matters pertaining to Research and Analysis. His courses include Quantitative Techniques, Business Analytics, Multivariate Data Analysis, Marketing Research, Online Research and Pricing Research. He has more than 13 years of experience. For the first 5 years of his career he worked in the IT, MR and Data Analytics industry after which he has been a regular in academics. He also consults the current Delhi government and Delhi Commission for Women on matters pertaining to Research and Analysis.